It is a new year, plenty of self-help and inspirational stories are available and the resolutions we have all made that will last about another week or two. 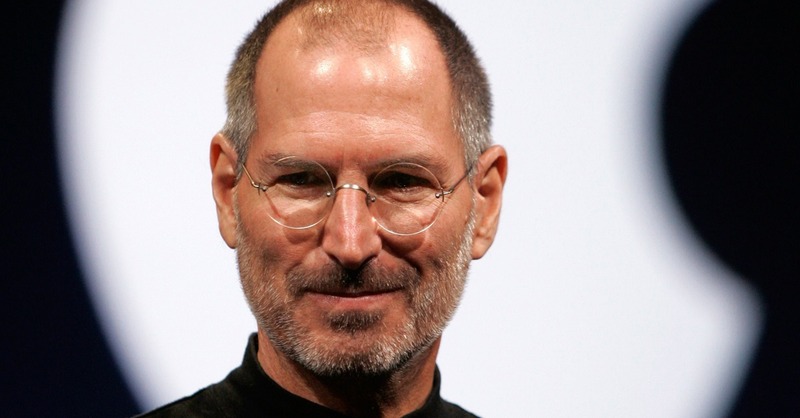 And some are based on some inspirational thoughts from Einstein to Aristotle to Jobs, and more. Of course others are less revealing and downright confusing or just plain silly. We all struggle with this (what is real and what is just fluff) from time to time. And then it happens. While pulling down the lights and placing the holiday decorations back in their boxes your child comes to you and asks you what to do, how to succeed where others have not and what is the difference between success and everything else. What? So, how to respond? This is serious business, no time to make light of the circumstances or blow off another conversation that always seems to end unresolved. My child is seeking knowledge and I’m now committed to deliver something worthwhile. He really wants to know. Even with all the chaos around us. Make the call you’re afraid to make. Get up earlier than you want to get up. Give more than you get in return right away always. Care more about others than they care about you. Feel unsure and insecure when playing it safe seems smarter – it will all be work out. Invest in yourself even though no one else is – what do they know? Prepare to look like a fool while you’re looking for answers you don’t have. Deliver results when making excuses is an option – this is really not an option. Make mistakes and look like an idiot – this is not the end of the world. Be kind to people who have been cruel to you – they don’t know any better. Be accountable for your actions even when things go wrong. Yes this is true, now everything is packed away carefully for next year and to my son I can only hope I have passed the audition; and you have come to realize something for yourself reading this. In my analytic practice I do quite a bit of sentiment analysis. This is not a technology discussion or another post about algorithms. 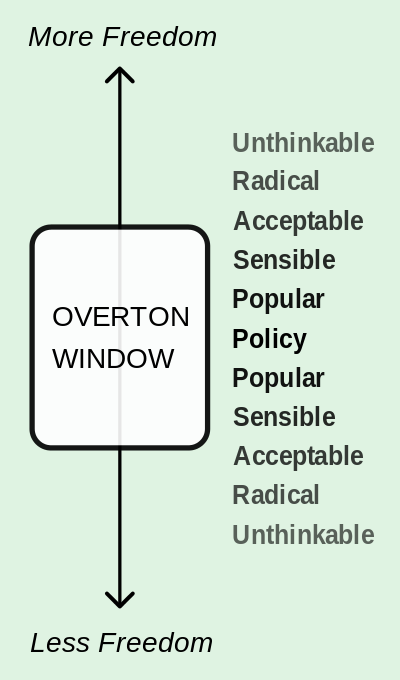 This is a quick introduction to the Overton Window, a key concept that has helped me make some sense of what seems to make no sense at all sometimes where politics and sentiment analysis are concerned. Understanding this concept has helped when trying to identify business insights, understand customers, prospects, and opinion leaders to discover what others are saying about their brand, products, reputation and their competitors in a more meaningful way. And does provide a useful way to filter or mitigate cognitive bias which may sometimes lead to perceptual distortion, inaccurate judgment, illogical interpretation, and sometime just plain irrational behavior. This is also one way to help understand the bigger picture in public policy debate and uncover key trends which can be mystifying at times. With all the craziness going on in the world today sometimes it helps to peer beyond the trees to see the forest. This is hard to do with the provocative (and sometimes entertaining) statements, name-calling and the unnecessary marginalizing of those with a different point of view. See this post for one example where Donald Trump Has Brought Discussion of Political Impossibilities into the Open. Before reading this I’m sure many of you had to wonder about why someone like this with a commanding lead among his peers would take risky policy positions that seem to defy gravity and diverge from generally accepted views. And why this approach is succeeding where so many others have failed. How can seemingly smart leadership take a position that seems to be so surprising given the firestorm of political conflict created? Is it just me (why is this so obvious, am I the idiot who didn’t get the memo)? Has anybody in this political arena really stopped to consider the unintended consequences of their own response? Is someone labeled by others a lunatic and a fool simply telling the truth? mystery to me until I ran into a concept known as the Overton Window. 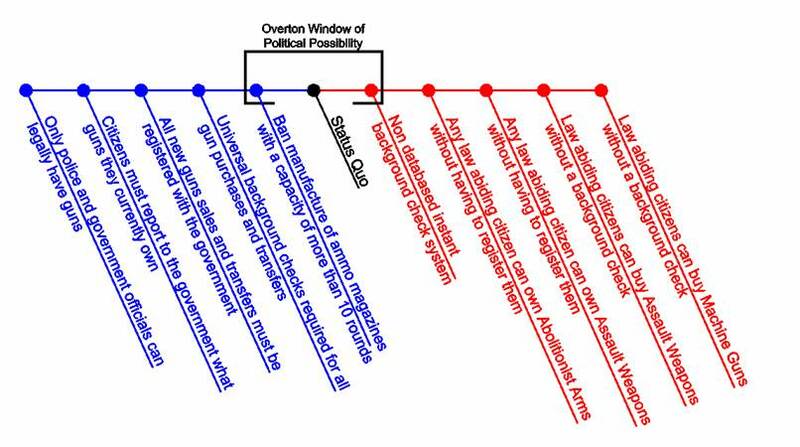 The Overton Window, also known as the window of discourse is term originated with Joseph P. Overton (1960–2003), a former vice president of the Mackinac Center for Public Policy. He described a window (or range) that an idea’s political viability depends mainly on whether it falls within the window, rather than on politicians’ individual preferences. This window includes a range of policies considered politically acceptable in the current climate of public opinion, which a politician can recommend without being considered too extreme to gain or keep public office. 1. W3C is the only organization defining web standards. 2. Other organizations may exist, but they haven’t produced anything useful. 3. Other organizations and standards may exist, but W3C is the only legitimate organization that should define standards. 4. W3C standards should be preferred because they are technically superior. 5. W3C is one standards organization among many. Vendors should support multiple standards, and content producers should choose the standard that best suits their needs. 6. W3C standards are inappropriate for the public Internet, but may be useful in other environments. 7. W3C standards are not appropriate for any purpose. 8. W3C is not a legitimate standards organization. 9. W3C should be disbanded and replaced by another standards organization. According to Mark, “…in 2001, the Overton window (the range of acceptable opinions) was squarely on #1 for every web standard you could think of. HTML, CSS, RDF, SVG, XForms, WCAG, you name it. Vendor-neutral web standards were all the rage, and the W3C was, quite simply, the only game in town for defining such standards”. By 2006, “ …the W3C is now under fire on several fronts, and various people have publicly criticized various W3C standards and (in some cases) publicly abandoned the W3C itself.” The Overton Window had clearly moved. As Mark states “…there is usually no benefit in arguing too far outside the Overton Window. People who have been claiming since 2001 that the W3C should be disbanded (#9) have had a negligible impact on the ongoing debate. Their opinions are just too far outside the range of acceptable opinion, and they risk being dismissed as kooks. 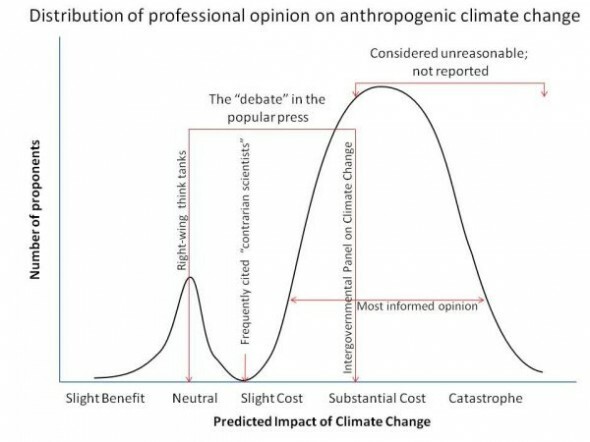 If the Overton Window does eventually shift far enough that such opinions become acceptable, those people may feel vindicated, but it is unlikely that they will have been responsible for shifting the debate”. Where else does this window exist and what does it look like? Consider the following example where the Overton Window of political possibility is depicted in a gun control or 2nd Amendment discussion (note the subtle cognitive bias introduced in the choice of colors). And see this terrific example from Daniel Herriges about Moving the Overton Window in urban planning. The implications of this concept should be recognized when analyzing the underlying data and its’ interpretation in social media and sentiment analysis. It has other subtle uses in transformation and change management. 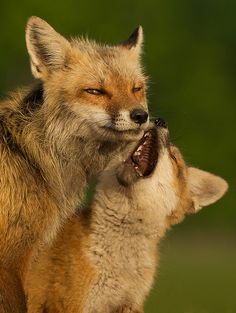 And of course in this crazy political season it may just help you understand the motivation and might just answer how smart leadership can take a position that seems to be risky, unreasonable, or just plain crazy like a fox. (for those old enough to remember when they used to count burgers sold chain-wide). Actually everyone you see in this picture has had a hand in many of the products and services you use everyday and have come to rely on. Like shipping freight across the world, using a credit card, paying an electric bill, caring for a loved one in a hospital, or helping our young people protect this country of ours. I never really thought about this until we all got together for one evening last week to laugh about old times. And then it dawned on me when I realized the collective contribution this group has made to a number of lives. Call us clueless geeks, hopeless loons, but I for one count myself lucky to have had the good fortune to be associated with each and every one of them. They have enriched my life in so many ways. And the best part? I still get to see them every now and then and raise a glass or two to old times. Welcome to the Applied Enterprise Architecture blog. Will try to keep this as entertaining as possible and encourage all to contribute and share their personal and professional experiences here. I will try to cover a number of topics with a dash of common sense and business experience thrown in to preserve my reputation as a seemingly expensive, over-priced management consultant intact. 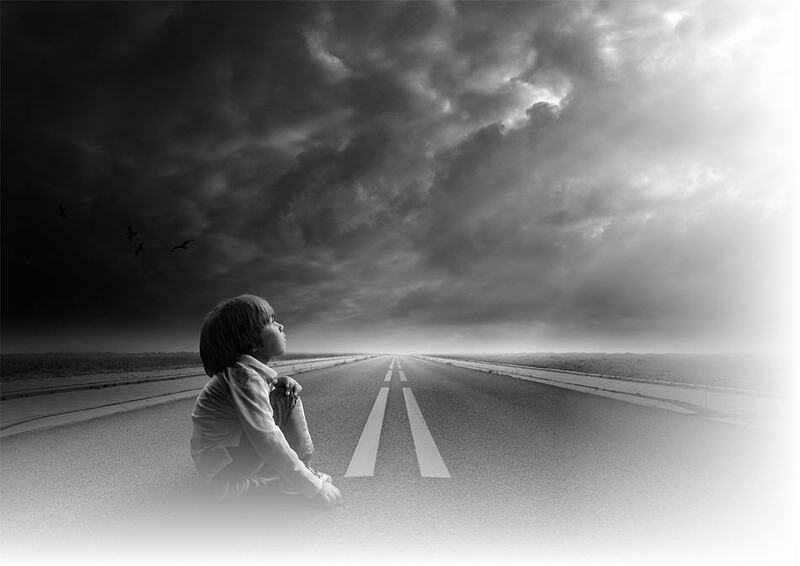 This eclectic collection of posts will in many ways reflect the kind of chaos and wide variety of issues will all encounter in our daily professional lives and by necessity will require a little patience from time to time. Just like our stakeholders, will try to contribute my understanding of the news, events, and invaluable contributions others have made to our profession. And, thank you for your interest, hope this will meet your expectations and you will become a regular reader and contributor.